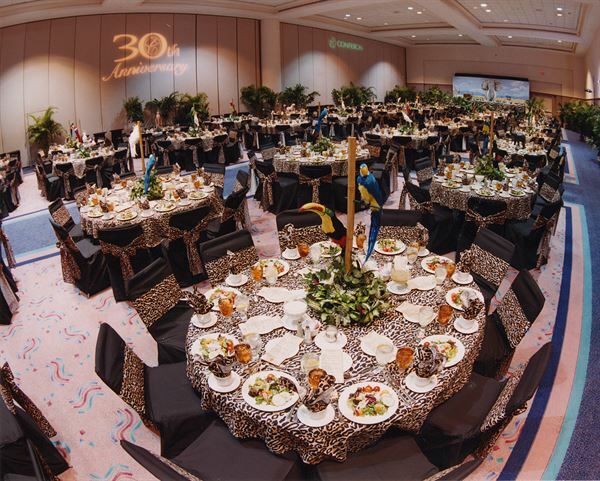 At the Tampa Convention Center, sparkling waterfront vistas bring the warmth and light of Florida sunshine right into your event. Whether you choose to be outdoors or indoors, we can provide you with everything you need to create a memorable experience at one of Tampa's most picturesque locations. Our beautifully appointed décor, sophisticated colors and distinct architectural design creates a unique experience that provides the comforts and services of a five star resort, while being nestled in the heart of Downtown Tampa. As an event planner, you'll appreciate our flexibility,, which features 600,000-square feet of indoor/outdoor space options, as well as a team of professionals whose expertise and experience in event production will assist you in creating the special moment. Whether you're interested in catering and banquet facilities, high-tech trade show displays, audio visual set ups, business services, trade show supplies or any other event service need, we can help! Take advantage of our expert in-house convention services and our unsurpassed relationships with experts and vendors in our community. Please contact our sales office for pricing and dates available. Call us to discover why Tampa Convention Center is a Treasure Worth Discovering! Whether you're interested in catering and banquet facilities, high-tech trade show displays, audio visual set ups, business services, trade show supplies or any other event service need, we can help! Combined Halls include West Hall; West Hall, Central; East Hall; and East Hall, Central. The Riverwalk is ideal for evening receptions and banquets. Divisible into 75,000 sq. ft., 100,000 sq. ft. and 125,000 sq. ft. sections. Thirty foot ceiling. Capacity for 1,000 10x10 booths. Loading docks for up to 22 tractor trailers. Direct access via three separate 25' x 20' doors. Telescopic riser section seats for general sessions and entertainment configurations. Show offices available. Concession areas. Floor load capacity of 350lbs. per sq. ft.
Tampa Bay Convention Center - A Beautiful Venue and Professional Setting - An Eventective User from Fort Myers, Fl. I attend Metrocon, a gathering of enthusiasts hosted to promote discussion of anime as an art form and hobby, each year at the Tampa Bay Convention Center and I have never once been disappointed. We are given access to the main suites and auditoriums for various functions, as well as several of the individual conference rooms; the venue is always clean and well-maintained. Signs are in place to guide you to each area of the convention center, and every room is very clearly marked and easy to find. The far wall of the convention center looks out across the bay in downtown Tampa through several two-story windows. The outdoor decks boast two escalators at front and back, and the indoor lobby provides four as well for maximum handicap accessibility. Several meetings or conferences often take place on a single day, Metrocon and the National Gymnast's Association, for example, but the two events rarely intermix. Each occasion is kept separate from the other, and the walls are very well-insulated as there is no bleeding over of sound during presentations. There has only ever been one double-booking of the convention center, when Metrocon took place within the building, and the annual Red Bull Flugtag took place on the bay and docks outside. The convention center staff was very cooperative, and provided additional security to keep the more unruly Flugtag guests from spoiling the conference inside. Food is sold in a cafeteria on the first floor, though eating is permitted throughout the building. Each entrance to the convention center opens directly onto the downtown Tampa streets, and there are several restaurants within walking distance. The trolley also passes close by, to take visitors to more ""touristy"" sections of Tampa Bay such as Channelmark and Ybor. A bridge connects the upper level of the center to the adjacent Embassy Suites (also recommended), so that guests may walk from their lodging to their conference without needing to cross in traffic. Overall, I have always found attending Metrocon at the Tampa Bay Convention Center to be an enjoyable experience. I would highly recommend it as a prospective venue to any businessman or woman looking to host an organized, professional conference at a beautiful locale. Each year, as a teacher for the Diocese of St. Pete, we have had a meeting at the Tampa Convention Center. It is for most people working and volunteering for the diocese, so you can imagine that there are thousands there. The convention center was ideal because it has many different rooms of varying size. We had a very large room to begin the day where everyone was able to fit. It was great because there was floor seating in chairs or bleacher seating further back. This helped because everyone could see what was going on and it was handicap accessible. They placed a large stage for the speakers in the center and had a great sound system and large screen so that everyone could see and hear the presentation. They had a room that was allowed to be set up with vendors, selling books and other articles that pertained to the meeting subject matter. There are also many smaller rooms which we used for various breakout sessions. Lunch was provided on the premises and set up in an easily accessible way. There were plenty of places to eat and you could even find a nice spot in the sun outside if you wanted. The employees that you see are helpful and able to point you in the right direction if you have lost your way. There are plenty of restroom facilities and drinking fountains too. You could also purchase refreshments inside or at a Starbucks across the street. There is also a parking garage, street parking and city machine metered spots so that everyone will be able to find a spot. The TCC was a great place for a meeting of such a large size but would work well for most any group.